Aquamira Water Treatment Concentrate kills odor causing bacteria, preserves and extends the storage life of emergency drinking water. The 2 oz. size is perfect for treating stored water in 55 gallon or smaller drums. Aquamira Water Treatment is ideal for use in treating water in RV storage tanks, on site water storage tanks such as cisterns or camp water systems and blue barrel emergency water supplies. 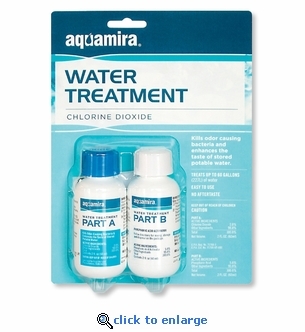 Aquamira Water Treatment (Chlorine Dioxide) provides 5-year storage for regular tap water or commercial bottled water for long term emergency preparedness. Aquamira Water Treatment treats drinking water using chlorine dioxide to kill bacteria, control the build up of slime and improve the taste of stored water. Easy to follow directions included with each package. Use only as directed. Each kit contains everything you need to treat up to 60 gallons of water. Controls slime build-up in water storage containers. Stored water has a 5 year shelf life once treated with Aquamira Water Treatment. Treatment solution has a 4 year shelf life from manufacturing date. Recommended by emergency preparedness professionals.